IMAGE: Here is a scheme of an iPSC colony emerging in a 3-D gel (made with DEMCON Nymus 3-D). EPFL scientists have developed a new method that turns cells into stem cells by "squeezing" them. The method paves the way for large-scale production of stem cells for medical purposes. Stem cells are now at the cutting edge of modern medicine. They can transform into a cells of different organs, offering new ways to treat a range of injuries and diseases from Parkinson's to diabetes. But producing the right type of stem cells in a standardized manner is still a serious challenge. EPFL scientists have now developed a gel that boosts the ability of normal cells to revert into stem cells by simply "squeezing" them into shape. Published in Nature Materials, the new technique can also be easily scaled up to produce stem cells for various applications on an industrial scale. There are different types of stem cells, but the ones that are of particular medical interest are the so-called "induced pluripotent stem cells" or iPSCs. These are derived from mature, adult cells that have been genetically reprogrammed to behave like stem cells (which is why they are "induced"). iPSCs can then be regrown into a whole range of different cells types, e.g. liver, pancreatic, lung, skin etc. 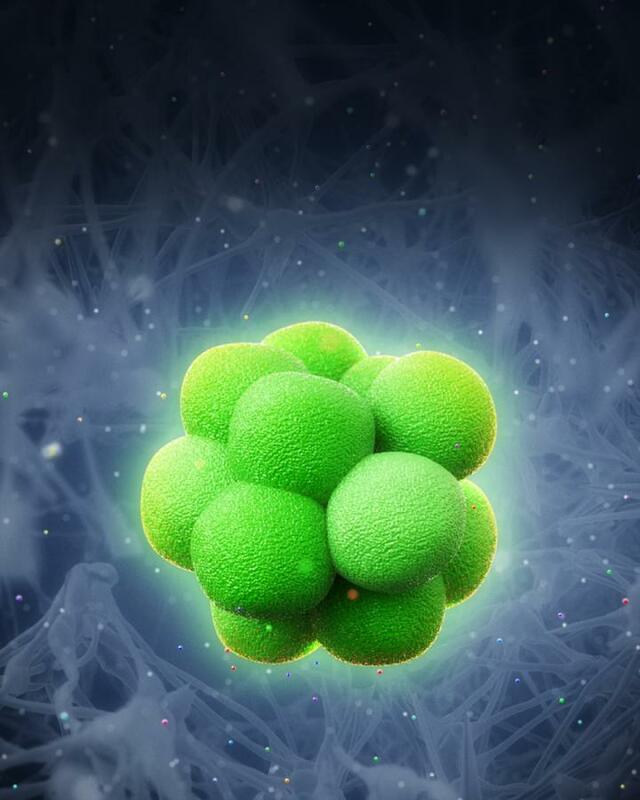 There have been many attempts to design a standardized method for generating such stem cells. But even the most successful methods turn out to not be very effective, especially for use on a large scale. A major issue is that existing techniques use the two-dimensional environment of a petri dish or cell culture flask, whereas cells in the body exist in a three-dimensional world. The lab of Matthias Lutolf at EPFL has now developed a new method that may help to overcome these challenges. The approach uses a three-dimensional cell culture system. Normal cells are placed inside a gel that contains normal growth nutrients. "We try to simulate the three-dimensional environment of a living tissue and see how it would influence stem cell behavior," explains Lutolf. "But soon we were surprised to see that cell reprogramming is also influenced by the surrounding microenvironment." The microenvironment in this case, is the gel. The researchers discovered that they could reprogram the cells faster and more efficiently than current methods by simply adjusting the composition – and hence the stiffness and density – of the surrounding gel. As a result, the gel exerts different forces on the cells, essentially "squeezing" them. As a new phenomenon, this is not entirely understood. However, the scientists propose that the three-dimensional environment is key to this process, generating mechanical signals that work together with genetic factors to make the cell easier to transform into a stem cell. "Each cell type may have a 'sweet spot' of physical and chemical factors that offer the most efficient transformation," says Lutolf. "Once you find it, it is a matter of resources and time to create stem cells on a larger scale." The greater impact of this discovery is possibly quantity. The technique can be applied to a large number of cells to produce stem cells on an industrial scale. Lutolf's lab is looking into this, but their main focus is to better understand the phenomenon, and to find the 'sweet spots' for other cell types. This work included a collaboration between EPFL's Institute of Bioengineering, Core Facility PTECH, and Institute of Chemical Sciences and Engineering. It was funded by the EU (Framework 7; PluriMes), SystemsX.ch (StoNets), the European Research Council, and the Swiss National Science Foundation (Singergia).